The Ministry of Social Development and Sports, in partnership with the Mirrors Alumni and Friends Association, has announced another five of the 25 NFL players confirmed to visit Bermuda for the inaugural Ed Block Bermuda Celebrity Classic. The event will be held from July 10-12, with NFL players participating in a Power of One Youth rally and a celebrity golf tournament on July 11 and 12. The Mirrors programme participants will be ambassadors for the day working with the middle school aged youth and NFL players at the Power of One Youth Outreach rally as a part of their community service project. Teche Minors, a current Mirrors participant, said, “Not everyone gets the opportunity to meet famous people or celebrities anytime in their life. “As a participant in Mirrors who is participating in the Ed Block Bermuda Celebrity Classic, I am very honored to be able to have the opportunity to work together with the NFL Players and middle school students. Even though I might not know all of the players or support their teams I feel that this is such a great opportunity because of the player’s backgrounds. A spokesperson said, “The Power of One Youth Outreach rally has targeted middle school aged students from 10 -14 years to enjoy a fun, energizing and empowering day with the celebrity guests and local athletes. The focus is to engage in activities that will give young people hope and inspire them to continue to develop leadership skills for their success. “Middle schools and Big Brother Big Sisters have been allocated registration spots for the event. After June 1st the remaining spots will be on a first come first serve basis. “Additionally golfers that are interested in playing in the golf tournament with NFL players on July 12, 2016 can contact the Mirrors office for registration information. Again, spaces are limited and we encourage you to register early for the event. 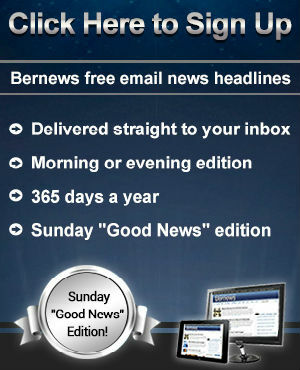 “The Ed Block Bermuda Celebrity Classic raffle tickets are currently on sale at various venues across the island and can be purchased from the Mirrors office. Cohort 11 participants will host several tables in the community over the next few weeks to sell raffle tickets. We look forward to the community’s support. 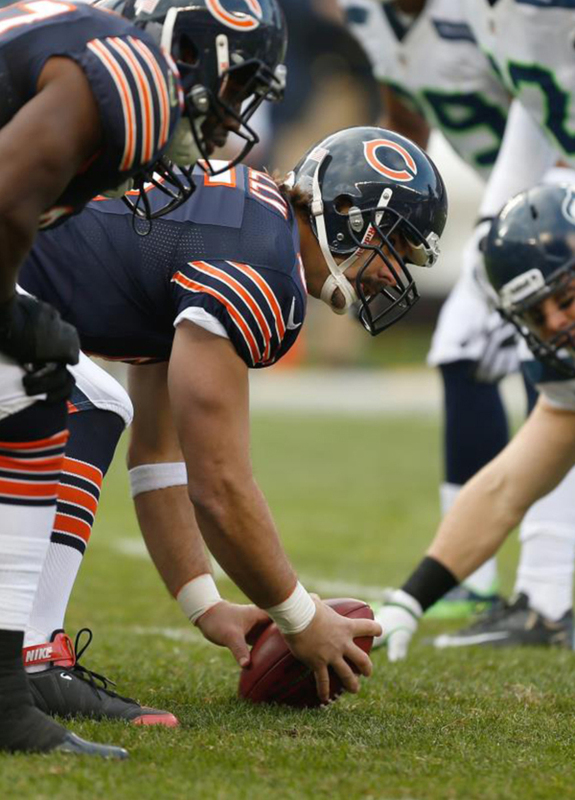 Chicago long snapper Patrick Mannelly played 16 seasons as a member of the Bears he is the franchise record holder in both seasons played and games played. 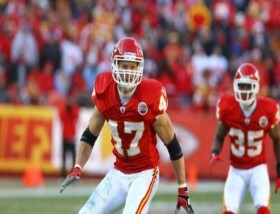 He has been the Bears special teams captain for the last six seasons [2008-13]. 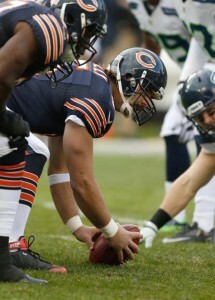 Mannelly played in 239 games in a Bears uniform. The 239 games played are the most among active NFL players with their current team. Patrick and wife Tamera’s main philanthropic focus is The American Foundation for Suicide Prevention. They raise money each year for Team Taylor in memory of Tamera’s brother, Taylor John, who passed away on March 10, 2010. They also walk in the Chicagoland Out of the Darkness Walk each year in support of AFSP/Team Taylor. Team Taylor has been one of the top two AFSP fundraising teams each year since 2010. Additionally, they support the Montessori School of Lake Forest, Beacon Academy and the SEDOL Foundation. They also annually assist with the Chicago Bears holiday giving initiative. Throughout his NFL career Jon McGraw exemplified family and team commitments, sportsmanship and very importantly courage. Through hard work and determination, Jon overcame numerous physical setbacks. More importantly, it’s what Jon does off the field that truly displays the type of character he possesses. His commitment to his family, the community and the team are just a few of many reasons why he is the recipient of the Ed Block Courage award. During his career Jon has played admirably through severe injury and surgery. He has played through many surgeries in his 10 year career. Most memorable was starting in the defensive secondary the week after having several pins placed in the fractured thumb. He continued to play in a cast for 8 weeks never missing any practices or games a week after the surgery; not an easy task considering how much a defensive back requires his hands to play his position effectively. Arthur Moats was selected as the Buffalo Bills’ Ed Block Courage Award recipient in 2013. After recovering from sports hernia surgery in the 2013 offseason, Moats has started a career-best 12 games in 2013 as an inside linebacker. 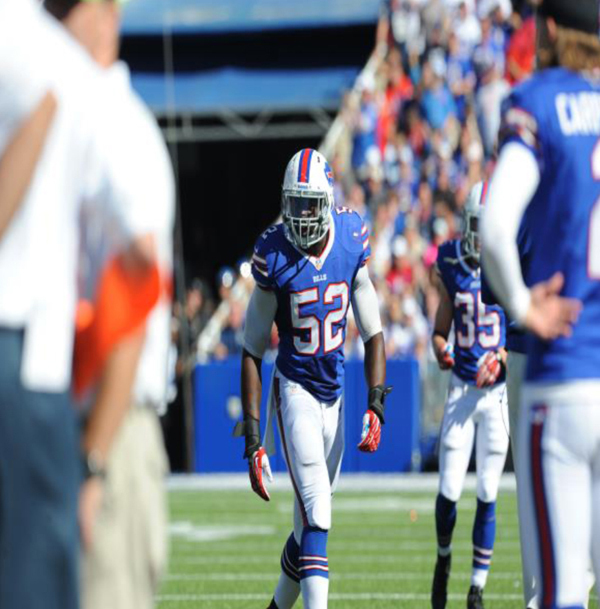 He’s been a mainstay on the Bills’ special teams units with six tackles on the season. Along with his standout play on the field, Moats has also left a lasting impact with his work in the Buffalo community. Arthur was named the 2013 Buffalo Bills United Way Worldwide spokesman where he was tasked with spreading the United Way’s mission and encouraging people to donate their time to their local communities. During the holiday season, Moats hosts select Buffalo students on a holiday shopping spree at a local department store, providing each student with a $200 gift card. 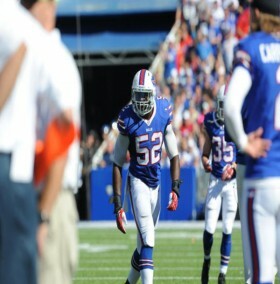 In addition to his work with the United Way, Moats is a lead spokesman for the Bills’ Play 60 initiative. In his hometown of Portsmouth, Va., Moats donated $5,000 to his high school’s football program through the NFL Foundation’s Matching Grant, as well as an additional $2,500 to the school’s art program, helping blend together two of his greatest passions. Moats has continued his tireless work off the field during his time in the Pittsburgh Steelers organization in 2014 and 2015. Reggie Hodges was the Cleveland Browns 2012 Ed Block Courage Award Recipient. Reggie was the first punter in team history to win the award. After missing all of 2011 with a ruptured Achilles tendon, Hodges returned to form in 2012. 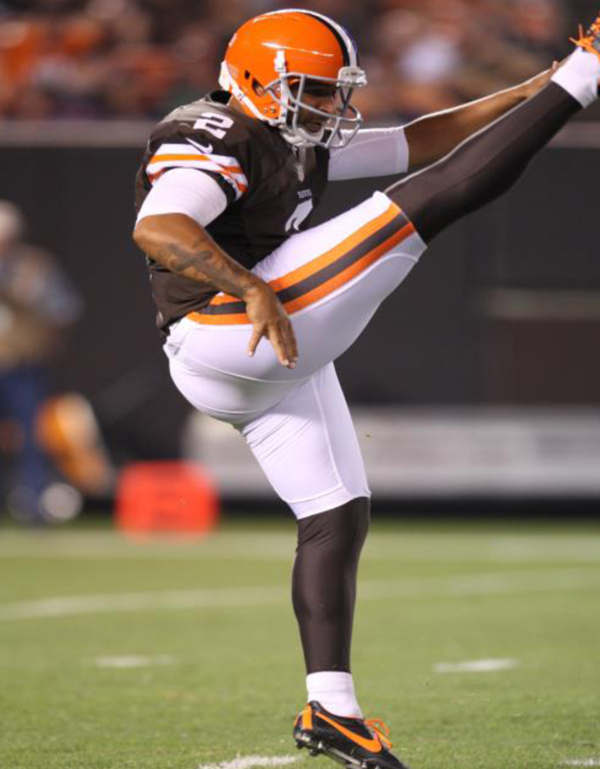 Hodges punted in all 16 games for the Browns punting 90 times for an average of 41.8 yards per punt with 29 punts downed inside the 20 yard line. During the offseason, Hodges, along with teammates Mohamed Masssaquoi and Benjamin Watson, went on a mission trip to Jamaica, where they provided shoes and supplies for kids. Hodges has also been very active in the Cleveland community, volunteering his time for events at the City Mission and Providence House. Hodges and his wife, Arin, also participated in the Browns Adopt-A-Family program through the Littlest Heroes, an organization that works with kids diagnosed with cancer and their families. Wally was the Baltimore Ravens’ Ed Block Courage Award recipient in 1997. 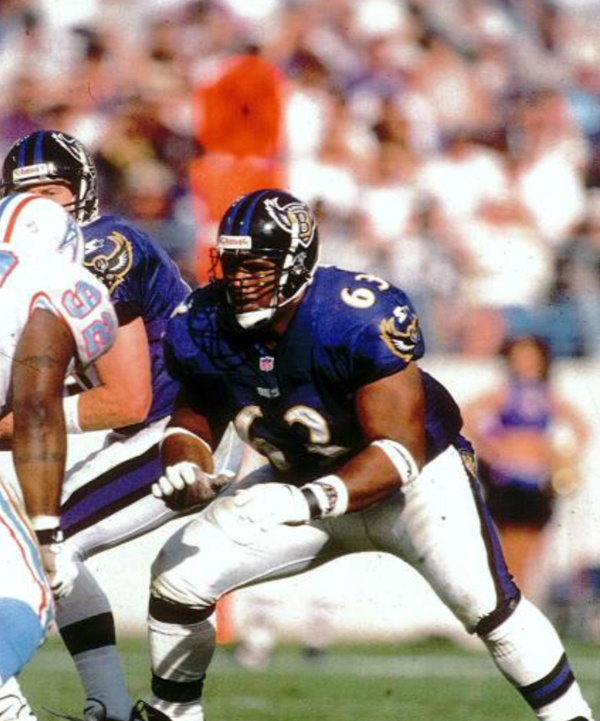 Wally played for the Cleveland Browns, Baltimore Ravens and New Orleans Saints in his 10 year career. He is a member of the Florida A & M sports Hall of Fame.